Winter is abound and there’s no better time for the fashion-forward stud to strut his stuff. After all, men’s fashion was born for the months when layering won’t induce heat stroke. Ryan Beyer, manager of custom clothing at Stitched Lifestyle inside The Cosmopolitan of Las Vegas, shares his top picks for playing the trends right during the cooler months—even if in Vegas, that merely means a low of 40 degrees. Whether he made top pick for varsity or rode the bench on JV, nothing’s going to stop the now-discerning gentleman from fronting this season’s choicest outer garment, the varsity jacket. Updated with a mixed media look—think nylon, sweater materials and various hues of leather—a bomber jacket cut completes the style by offering that timeless collegiate feel. One would be hard pressed to find a photo of David Beckham post-summer in any shoe other than the Chelsea boot—so obviously, it’s a clear winner. With its narrow toe and clean finish, Beyer suggests it best worn in suede. “Ours are from Allen Edmonds, so they’re meant to be workhorse boots and survive in a New York winter,” he says. Sleet and snow on the ground or not, the versatile boot pairs great with skinny jeans as well as with a suit. “This is not your grandfather’s corduroy,” says Beyer. And he’s certainly right. Slimmer, more modern shapes, fabric with some stretch to it and colors like crimson bring a newer, refreshed take on gramps’ favorite trouser. Match it with a sport coat for something that has texture and feels a bit more dressed up and fashionable than jeans or chinos. Speaking of modernized looks, the turtleneck has made its way back to cultural relevancy thanks to influencers like Steve Jobs and the stars of his biopics from the last few years. OK, that might not be fact, but what is indisputable is that the “elevated t-shirt” (as Beyer refers to it) should be paired with anything other than the dad jeans-white New Balance combo. Try it with more contemporary denim or stick to a respectable pair of slacks for an elegant take. It also goes nicely under a blazer. Gone are the days of muted suits and conservative men’s fashions. 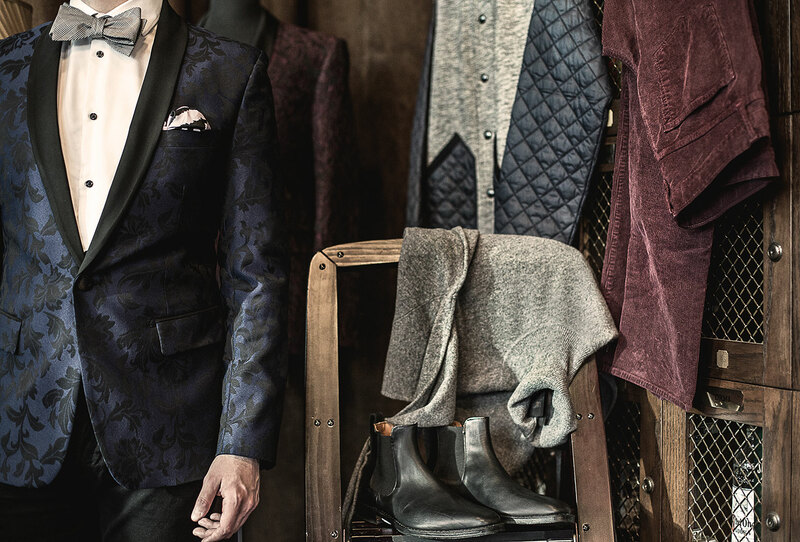 Enter the jacquard dinner jacket. Sure, something so bold might seem reserved for pro athletes and Kayne West, but done right it’s a surefire way for the remaining male population to stand out while still exuding class. “This is something we’ve been hip to for many seasons,” Beyer says. “Wear it with tuxedo pants, a white shirt and a bow tie when you need to go a gala.” As for Saturday night dinner? Denim and an open collar white shirt will do the trick. #fashionhack: “Remember that the bottom button of a jacket should always be unbuttoned,” Beyer says. “That’s one of those things that seems 101, but we see it all the time.” He also urges, “Check the vent of your jacket. It’s not supposed to be sewn shut, it’s supposed to be open.” Read: Cut that temporary stitching in the back when you get home, gentlemen.